Are you going to be in town for Easter 2019? If so, you have picked the perfect place to spend the holiday right here at Sea Watch Resort. 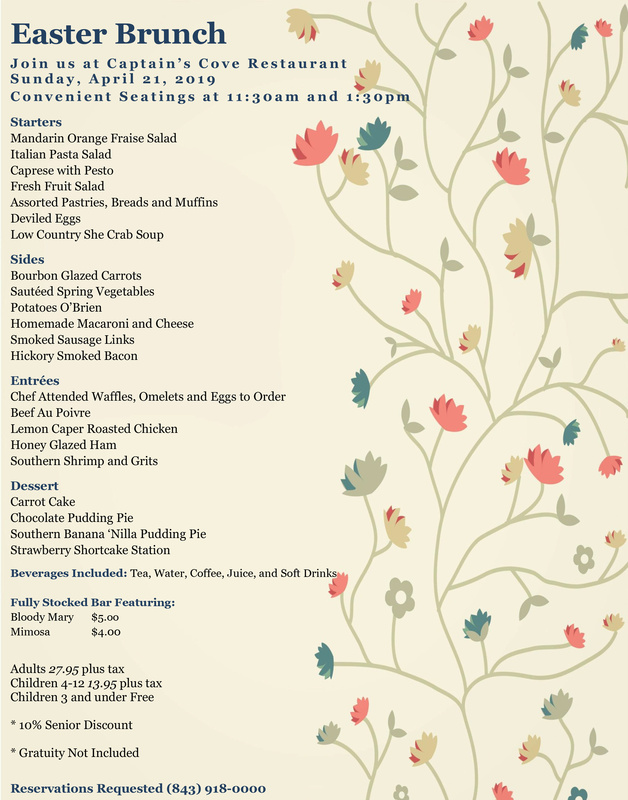 We have a wonderful Easter brunch prepared for our guests! Sea Watch Resort will be having an eggcellent brunch with a mouthwatering buffet with two seatings at 11:30 a.m. and 1:30 p.m. on Sunday, April 21st in Captain's Cove Restaurant. The buffet will include assorted pastries, deviled eggs, low country she crab soup, homemade macaroni and cheese, and more! Or if you are feeling more in the mood for breakfast when you stop in, you can fill your plate up with homemade waffles and a made to order omelet. You can’t forget to indulge your sweet tooth with the chef's assorted holiday dessert station. Tea, water, coffee, juice, and soft beverages will be included! Brunch is $27.95 +tax per adult and $13.95 +tax per child (4-12); children under 3 eat free and seniors 65+ get a 10% discount. Call 843-918-0000 ahead of time for reservations. This brunch can also be added online or on the phone when you make your room reservation in one of our studios, and one-bedroom, two-bedroom, or three-bedroom accommodations. Don’t miss out on all the fun and eggciting Easter activities while you vacation in Myrtle Beach and book your holiday getaway today!